I'm not good at waiting. 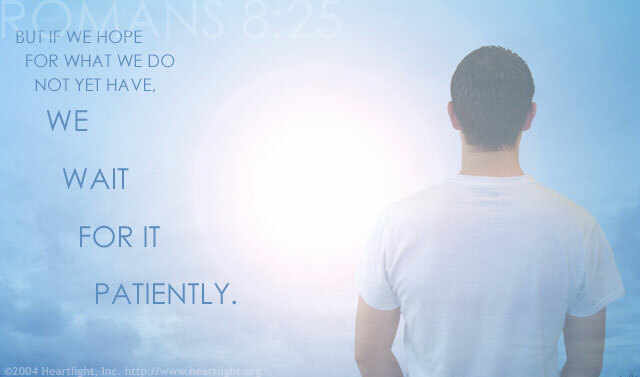 But, my hope in the Lord gives me patience that is beyond my human tendency. As much as the Lord has blessed me, I'm fully confident that I can't even imagine the good things he has in store for me. So while I wait, I try to stay busy; busy loving my Father in heaven and sharing his grace with others. Thank you, dear Father, for the patience that I possess as I await Jesus' coming. This patience is beyond my normal inclination and I recognize it as a gift from your indwelling Spirit. Bless my efforts at leading others to know Jesus and to find salvation in him. Bless my faith so that it will be strong and endure my waiting. Bless my life, not with things, but with godly character so that my life can be a light to others. In Jesus' name. Amen.